This walk: 2012-7-18. Cows, Nun's Cross / Siward's Cross, Eylesbarrow Mine. 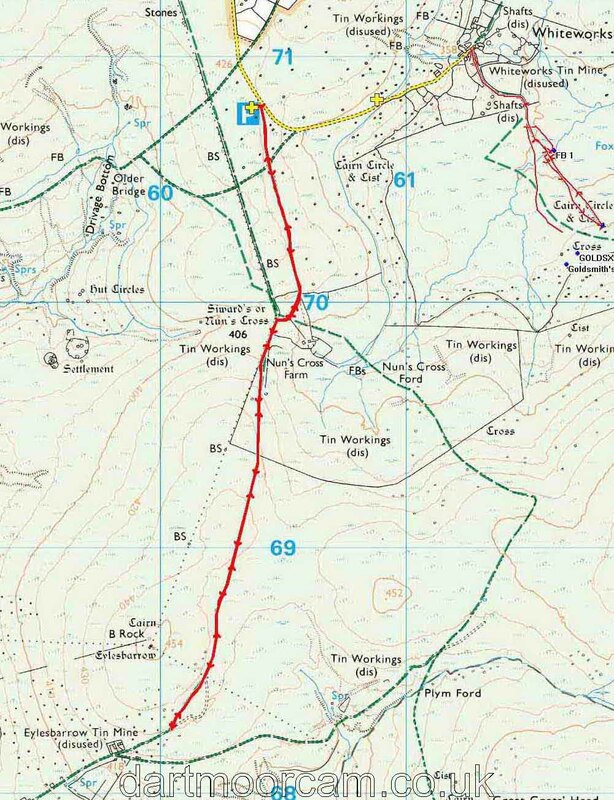 Link to Google Satellite view of the area - the car park is in the midline, ¼ way down, and the destination is midline, about ¼ the way up from the bottom (south of two white stone cairns). We had to move the cows to get into their car park! I thought if this was a Number 5 coming along, I might get on it and go home - it was that sort of a day! A view along the Jobber's Path (Tavistock Branch, as marked on the Harvey Map). The southern section of the path linked the wool-producing areas around Sheepstor with the mills at Buckfastleigh. Jobbers were the men who bought and carried wool or woven cloth. Look at the state of the path today - I remember days when the sun was splitting the gravel! An apparition of Siward's Cross or Nun's Cross ..... there is often argument among walkers as to what is inscribed on the cross, today there could be argument as to just where the cross is! Group photo - smiling faces. Are you sure its this way? When we reached old diggings of Eylesbarrow Mine, this is what we saw - only less clearly because of the rain.